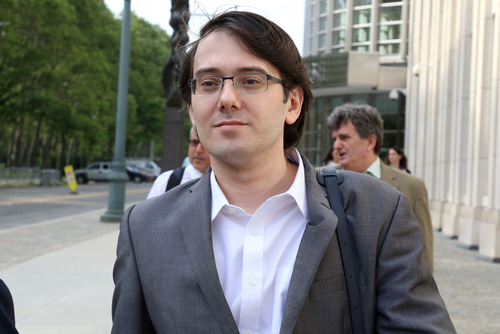 A federal judge revoked the $5 million bond for self-described “Pharma Bro” Martin Shkreli on Wednesday because of Facebook posts by the former drug company CEO that offered $5,000 for a hair from Hillary Clinton. U.S. District Judge Kiyo Matsumoto of Brooklyn, New York, said the cash offer was “a solicitation to assault” that is not protected by the First Amendment.” The New York Times, the Washington Post and the Wall Street Journal (sub. req.) covered her decision. Shkreli is awaiting sentencing after he was convicted Aug. 4 on three of eight counts in a securities fraud trial. He was accused of using money from Retrophin, his publicly traded drug company, to pay back investors who lost money in two of his hedge funds. Lead prosecutor Jacquelyn Kasulis said Shkreli had shown an “escalating pattern of violence against women” in his social media posts, according to the Washington Post account. “He knew exactly what he was doing,” she said. Brafman compared Shkreli to comedian Kathy Griffin, who held up a fake bloody head of President Donald Trump, and even to Trump himself, who suggested “Second Amendment people” might be able to act if Hillary Clinton were elected and got to appoint judges.